A few weeks ago I packed up the gear, took a way-too-early flight out of Los Angeles and landed a few hours later in St Louis, where I would be photographing the recently-restored Sun Theater for the St. Louis based architecture firm The Lawrence Group. 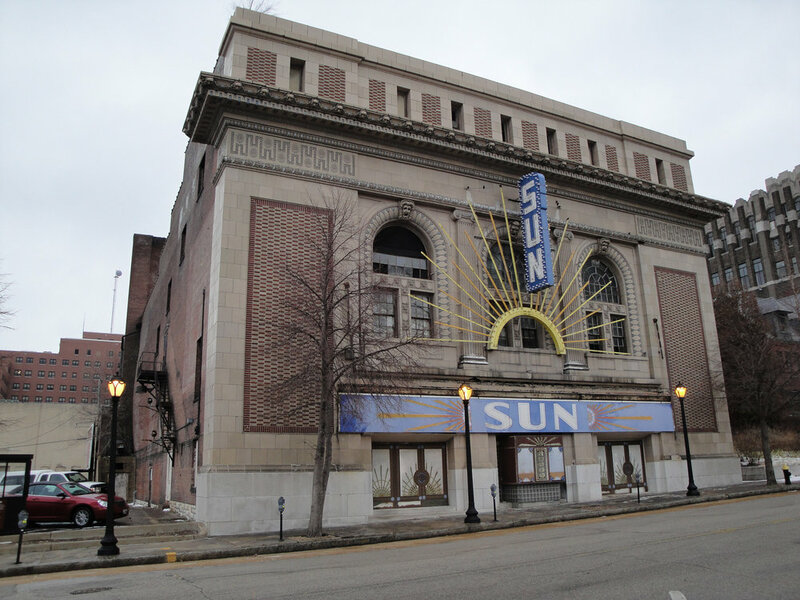 The Sun Theater has a long and storied history - first opened in 1913 as a theater for German-language plays, it went through a number of changes over the years - from playhouse to movie theater to men's club and just about everything in between. 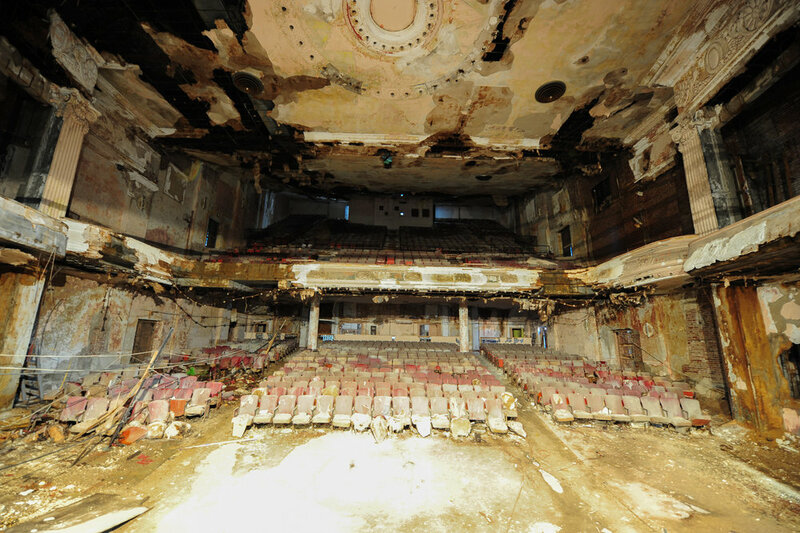 Roughly 40 years ago, it was left abandoned as demand declined and other theaters competed. During this time, the building was left exposed to the elements: countless freeze-thaw cycles, a roof that leaked like a sieve, and of course the damage caused by local troublemakers. Pieces began to fall off, walls began to collapse, and nature began to take a toll on the building. In 2010, a new school was founded near the old Sun Theater. The Grand Center Arts Academy, which caters to grades 6-12, moved into nearby buildings. 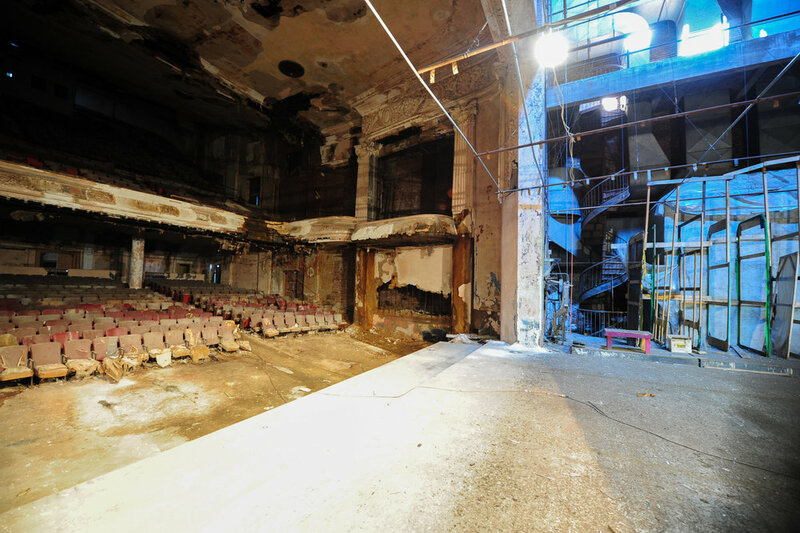 With a curriculum focused on performance and visual arts, the GCAA had a vision of restoring the theater to its former glory for use as both a performance venue and classrooms. Over the last five years or so, they worked with The Lawrence Group to study the building and assess the feasibility of restoring it. According to Aaron Bunse, the project director at The Lawrence Group, the building's bones and foundation were solid as a rock. The building, he said, was built like a tank, and most of the damage was cosmetic. A restoration was definitely feasible, and in January of 2013 renovations began. After a little more than a year and roughly $11.5m were poured into it, the theater has undergone a major upgrade and the results are simply stunning. The Lawrence Group hired me to create a series of photographs showing the updated Sun Theater, and over the course of three days (two shoot days and a scouting day) we made seven images: two exterior twilights and five interior photos. Let me be honest, when you walk in this place, it is absolutely breathtaking. I've never seen a theater with such a juxtaposition of modern amenities and early 1900s detail. The restoration that went into this is simply jaw-dropping. Capturing it proved to be both tricky and rewarding. As usual, the biggest challenge was lighting. Switching breakers on and off, adjusting dimmers, adding light and removing light. Every shot took a fair bit of lighting work, which isn't out of the ordinary, but when you're dealing with a space of this size, it sure is exhausting! I've gone ahead and with the permission of my client, used a number of their 'before' pictures, so you can see how the theater looked before undergoing restoration compared to my photographs of the finished theater. This is the view when you first walk out into the upper balcony area. An enormous stage flanked by a golden proscenium and a striking yet calming blue color palette to contrast it. Many thanks to Aaron Bunse of The Lawrence Group who graciously let me use the 'before' images, on the left, to compare with my 'post renovation' finished images on the right. You can click each thumbnail to expand the images to a larger size. Looking across from the balconies, you can begin to appreciate the amount of restoration work that went on here. Much of the plaster work across the proscenium was destroyed over time, and it was all restored by hand using the same methods that were used to install the plaster back in 1912-13. Standing on the stage, you get to see just what an incredible transformation the place underwent. I'm in love with the colors they chose, as well. I can't imagine being a high school student and walking out to this - nerve wracking! From this angle, you can also see how they redesigned the building. They removed a few hundred seats to add classrooms behind the far rear wall, providing the students with more than just a huge concert hall. There are rehearsal rooms, standard classrooms, and small amphitheater-like rooms for small ensembles to play in. From the back of the stage, the scale of the building becomes evident. The Sun Theater was built with a huge backstage area, with a flywall tall enough to accommodate multiple stage backdrops and plenty of rigging. 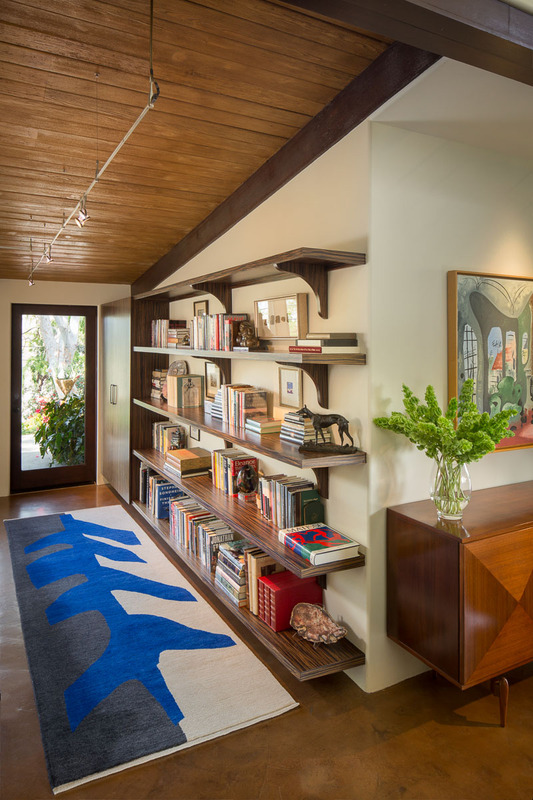 In the front, the entryway is no less beautiful than the rest. Marble floors and hand-made plaster moulding make for a pretty grand entrance. Much of the smaller details were re-created by The Lawrence Group simply by hand and drawing in details, then brainstorming to figure out how to reproduce it. So much of the plasterwork had been lost to time that in many places, educated guessing was the only way to go. And outside, the front facade has been impeccably restored. From this angle, you get a sense of the context in which the Sun Theater is placed. To the right, the rest of the Grand Center Arts Academy campus can be seen, as well as the theater scroll for the Powell Symphony Hall, another St Louis mainstay. After three days of shooting, I was absolutely spent. Once I landed in Los Angeles, I think I slept for a good 12 hours after all was said and done. It was a hell of a job but I am so thrilled with how the images turned out. I can't speak highly enough of The Lawrence Group and their work on this project. It was also an incredible honor for me to be chosen to photograph this job - with so much history and so much excitement riding on the line, for both the people of St Louis and the school kids and staff at the GCAA. I felt really lucky to have been a part of it - and hope that these images can be enjoyed by everyone who helped on the project. When all is said and done, I'm absolutely thrilled with this project in every way. It was so great to be a part of this project, even if in just my own little way, and I'm really looking forward to adding these shots to my portfolio. It's been a crazy few weeks here, and it doesn't show any sign of slowing down, so expect a few more posts in the coming days, and many more travel gigs lined up this summer so plenty of meaty blog posts to come. It would appear that I've been bitten by the aerial bug - quite hard, in fact. What began as a half baked idea to shoot real estate and architecture from a helicopter turned into a full-fledged fine art book. 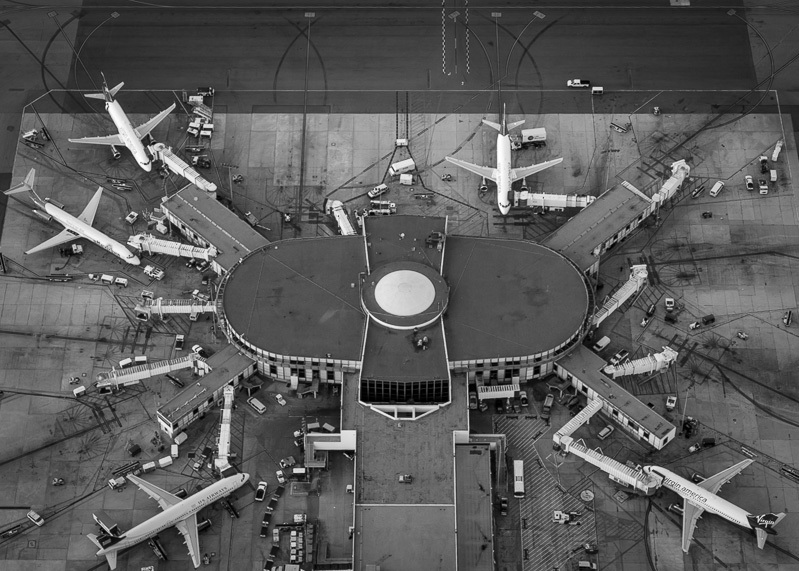 So that's the new goal - take 15, 20 flights, amass a huge collection of black and white photographs, and get it together in a big, heavy, thick coffee table book, as it's something I've always wanted to do. I've been keeping an eye peeled for my latest personal project and thankfully, this one is right in my own backyard. Los Angeles is a thing of terrible beauty; and sometimes downright misery from street level. But once you're up in the air, it transforms entirely into something else. There are endless opportunities for composition with all of the lines of intersecting freeways, surface streets, and architecture. Every time I have flown in a helicopter now, I make a loose plan to get some shots I've pre-selected with Google Earth, etc. The problem that I have is that the shots I plan on come out just okay, but the shots that I don't plan for absolutely shock me with how awesome they are. That might sound cocky, but some of this stuff is beyond what I'd ever thought I'd be capturing. Shooting like this is definitely refreshing and a nice change of pace - it's one thing to put something together from a tripod, 10 lights and Photoshop, but it's something else entirely to be shooting something so alive. Nobody will ever recreate these images - and they exist for only a fleeting second. Trying to coax the light and mood out of them in post-processing is just eye-opening - things that you never notice from the air become simply magical once the files are worked over a bit. So, here's to this next project of mine. I've got a lot on my plate, as always, between my Iceland project, Pan-Am project, and now this, but these are just too cool to pass up, and I might as well strike while my iron is hot. I'm hemming and hawing over kickstarting this project or just doing it on my own, I'm not really sure yet. Time will tell! In the meantime, I've been invited to sell these prints throughout a few select stores in LA as well as online through PurePhoto. You can check out the full gallery and order prints, if you're interested, by clicking here. Of course there are thousands of ways to photograph architecture from ground level, but an entirely different feel can be conveyed by photographing from the air. I've taken a few trips recently in a chartered Robinson R-44 to photograph homes in the LA area, and I've also taken some time to create images that I will sell as prints in a few interior design outlets and chains throughout California. Being such a huge aviation geek, shooting from the air is a total treat. Hanging out of a helicopter at a thousand feet, cruising at 80 knots with the door removed and the wind blasting by is always such a rush. There are a few things you have to keep in mind, of course, as this is an entirely different environment compared to shooting on the ground. No lens hoods, as the 80+mph wind would rip them right off if the lens poked beyond the canopy glass. You can't change lenses, because the slightest fumble would result in a very expensive drop (those cabins are TIGHT, and with all the wind and bouncing around it would be very easy to drop something and lose a lens, or kill someone below) and you have to know exactly what you want to shoot before heading up. At the low price of 10 cubic dollars per minute, loitering to get the right angle or find the right house is going to cost you. Pre-flight planning is super important! You want the right light, the right weather, the right orientation, the right elevation, and the right composition. A big ask! Of course, it all takes a skilled pilot to get you where you want to go on the first try. It's best to work with someone who has flown a photographer before and understands their needs with regard to light, timing, altitude, and so on. None of this would have happened without the understanding and patience of my pilot, who is able to manage all of my ridiculous photographer demands (up! down! left! right! do an orbit down there!) on top of dealing with the insanity that is LA airspace. But what I'm most excited about aren't the photos of homes that I've been doing (which, make no mistake, are hugely enjoyable and I love the results) but the photos that result when I let my creative juices flow a bit. A few weeks ago, there was a relatively large forest fire on the outskirts of Los Angeles. Knowing that this low-lying white, diffuse smoke could make for some fleeting and ethereal shots, I decided it would be a great time to get up in the air. Luckily, the conditions didn't disappoint at all. It was an expensive gamble, but one that definitely paid off. I don't think I've ever seen photos of Los Angeles that look just like this - which is something I always strive for. Why make the same photos of the same landmarks that everyone else has done a million times? The conditions have to be right, but when everything comes together, the results are very unique. I'm selling prints of these images at HD Buttercup in Los Angeles, as well as on www.purephoto.com - where you can also see most of my personal work for sale. Stay tuned for more - as I have a few more flights planned in the coming months, both in LA and in other areas. I'll be revamping my website shortly, too, with dedicated galleries for many of my photos which haven't seen the light of day. Lots of exciting things on the horizon here. A few weeks ago I shot a number of photos at Wrath Wineries in the Santa Lucia Highlands, about 45 minutes inland from Carmel and Monterey. I am happy to report that one of the images, the twilight exterior, has been featured in a USA Today article detailing all the amazing wineries in this area. Pretty excited with the headline coverage, here, to be sure! You can read the entire article and see the image here (or by clicking on the article below). I've also linked back to a blog post detailing how I made the image, which can be read by clicking here. Seems that these days a larger and larger percentage of my photography is taking place outside of Los Angeles, and I'm totally loving all of the new locations I'm getting to see on my travels. In addition to the Hahn Winery (seen in the below post) which I photographed, I also shot the Wrath Winery, also located in Soledad, CA, for a revamp of their marketing materials. Wrath is situated in the gorgeous Salinas valley, which makes for some very interesting lighting and fog effects at sunset. As the cool air from the Monterey Bay moves inland, it meets the warm air from the eastern side of the valley and condenses, creating a fog which rolls rapidly up the valley towards the vineyards we were in. While this caused me a bit of trouble while photographing Hahn, it made for a beautiful twilight down in the valley at Wrath. The clouds added great atmospherics and really let me play up the name of the winery - I felt like I could really push it with the processing on this, given the name, location, and lighting effects. This was lit with a combination of strobe and hot light - actually, scratch that - warm light - a Lowel GL-1, which doesn't really get hot like a traditional hot light, and is thus ten times easier to use for my style of photography. I've got the burn marks on my hands from regular hot lights to prove it. In addition to the GL-1, we had a series of PocketWizards set up in relay mode to help cover the enourmous distance between myself and the building. Due to the pond in front of me eating the radio signal, it took two or three PocketWizards to make it over there, but we finally got the system working flawlessly. The interiors of the tasting room, which is located in downtown Carmel, were lit entirely with the Lowel GL-1 - I am beginning to love this light more and more everytime I use it, as it has replaced speedlights and inkies in a number of applications for me. I kept the GL-1 bare with no gel in an effort to bring out some of the richness and color in the natural wood interior. I just love the warm quality of light that we created throughout. It took about 2.5 hours to create the three interior photographs - which was made tricky as a result of the tasting room being open for business, even though it was about 11am on a Monday. Thankfully, everyone was wonderfully accomodating and we even had a few people stop by to spectate and observe what was going on. Seems Carmel attracts a fair amount of hobbyist photographers who were keen to see the shoot in action. All in all, this was one of my favorite shoots in recent memory. It's not often you get to set up a tripod in vineyards, enjoy an amazing sunset, taste plenty of great wine, and come home with four portfolio-quality photographs. Jobs like this are a reminder of why I love what I do! I once again loaded up the car and headed away from Los Angeles to the Salinas Valley to photograph the Hahn and Wrath Wineries, both of which are located around an hour from Carmel in an amazing setting. Shooting these wineries presented a number of challenges, and I'm going to talk a little bit about how I overcame them. I know I've been on a bit of a hiatus lately, but hopefully this post makes up for it. First, let's talk about the shoot I did for Hahn Wineries in Soledad, CA. The client had a few ideas for shots that they knew they wanted, and they more or less left the rest up to me. I was given a tour of the grounds, and immediately settled on a few shots, and scratched my head over a few more. They had mentioned that they wanted a few great shots of their tasting room, which is one of their big attractions for visiting customers. The problem was that the tasting room is elevated about 20 feet off the ground on a steeply sloped hillside, and was entirely surrounded by trees on the high side. Any hopes of me creating an architecturally interesting photograph from the ground were quickly dashed, and my options seemed to be severely limited to either renting a helicopter (expensive) or using some extremely tall and unstable pole to shoot from the slanted ground below (a bad idea, and generally unsafe). While walking around and talking to the client, they pointed out a ridgeline on the other side of the valley where they often took customers on the tour to see the entire layout of the winery and its vineyards. 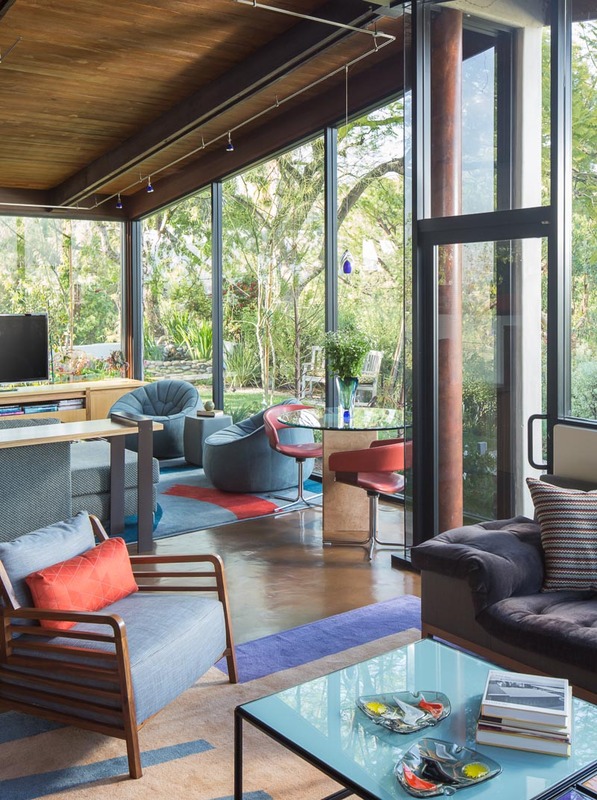 I was initially reluctant to try to shoot from this vantage point, as the small size of the tasting room would require some serious telephoto reach and would eliminate nearly all of the architectural appeal of the building. On a whim, I asked if we could take a ride up to the ridgeline to see if we could gather any other shots, and it turned out to be a pretty great vantage point from which to shoot the tasting room. While I didn't end up zooming in that far (we ended up shooting at 50mm) the shot actually looked like it might work. While you lose some of the architectural details of the tasting room, you do get an incredible view of the grounds and the sense of scale becomes immediately evident. I made a decision to make the twilight shot more about the entire winery rather than just the tasting room, which I will admit was a little daring on my behalf. After choosing where to take the photo from, it was just a matter of playing the waiting game until sunset. Once dark enough, I had my assistant Jaron head back to the tasting room armed with a big light and a walkie talkie. I'm happy to say that we were somewhat succesful. For this exterior view, we delivered two shots - one with light trails, and one without. I wanted to give a sense that you might be able to take a sunset winery tour in the ATVs provided by the facility, and even though the client didn't request it, I thought it was a cool add-on with minimal work involved, so I threw it in anyway. So, all that effort - do you think it was worth it? It's certainly a unique shot, the likes of which I don't have in my portfolio and it was something I don't think I'll be trying often. Another challenge for me was dealing with the fog that rolls into the valley and the haze that forms as a result. I'm not sure if it gives this photo a bit of mood and a sense of place, or if it just distracts. Below are a few more images from the job - my personal favorite is the image of the tasting room, shot with a Lowel GL-1 hotlight in complete darkness.